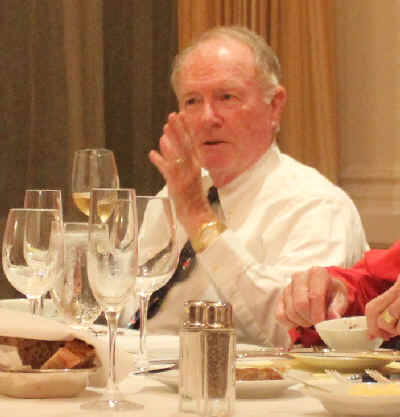 Meeting a week later than usual, the Vino Fino crew congregated (eventually) at San Francisco's Olympic Club. The holiday traffic was a challenge this year, but we all made it to the Club on Post Street in The City. We had a nice line-up of bottles and we double-decanted these. This means the wine is decanted off its sediment from the bottle...the bottle is then rinsed and emptied of the remaining wine and sediment...the clear wine is then decanted back into its original bottle. 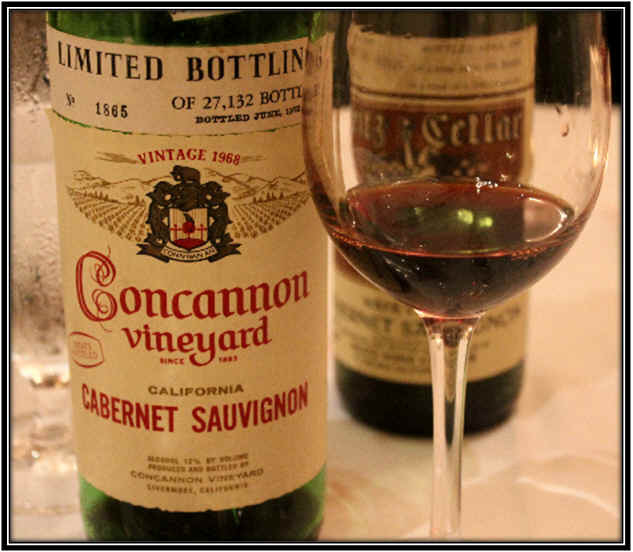 The last bottle in the line-up, though, a 1966 vintage from Concannon Vineyard, remained unopened until the moment of service. 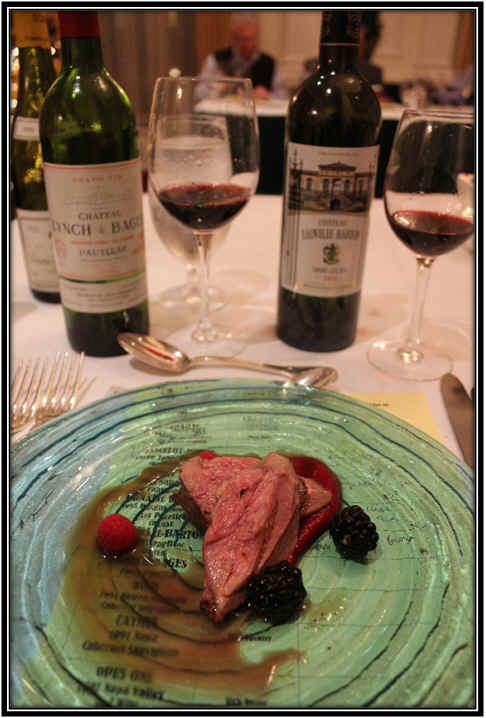 Decanting a venerable bottle such as that might be detrimental to the wine...if it's still alive, it might deteriorate with aeration while we are serving the other bottles over the course of the meal. 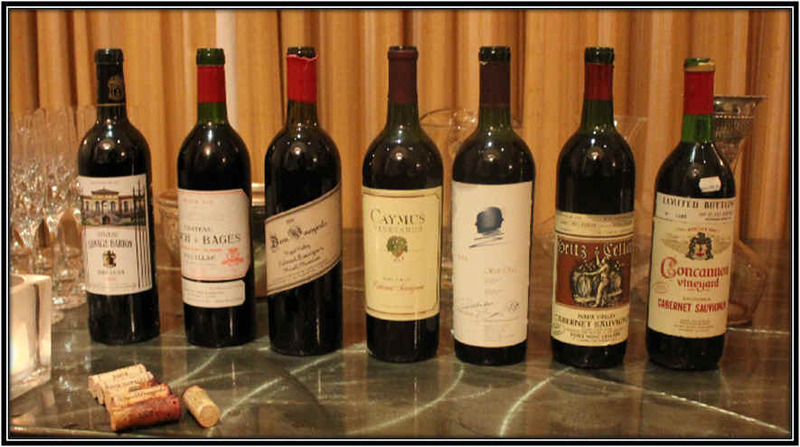 $6 was a lot of money in those days for a California Cabernet! The wine was bottled in 1972, so this was on the market in the mid-1970s. 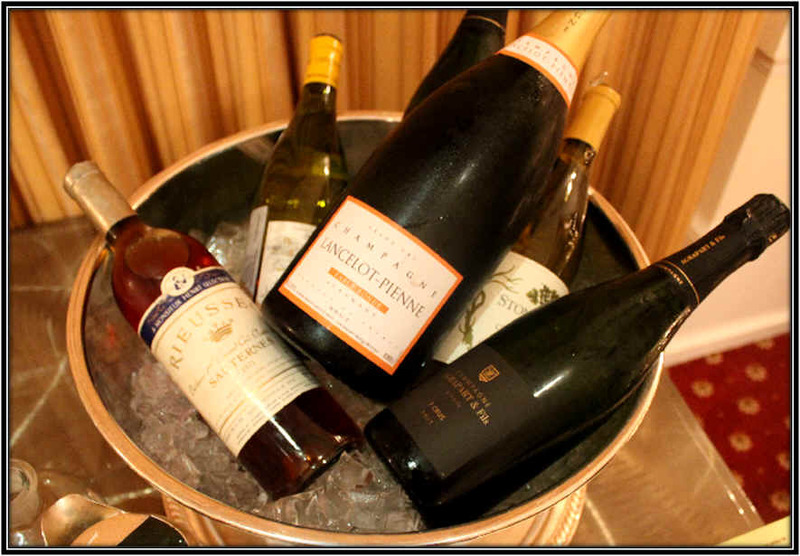 We had an ice bucket to keep the Champagnes and other white wines chilled. 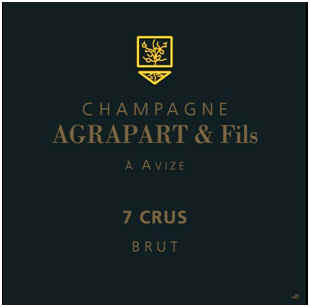 We opened a couple of 750ml bottles of Agrapart's Sept Crus Brut...mostly Chardonnay...mildly toasty and crisp/dry. Very fine. 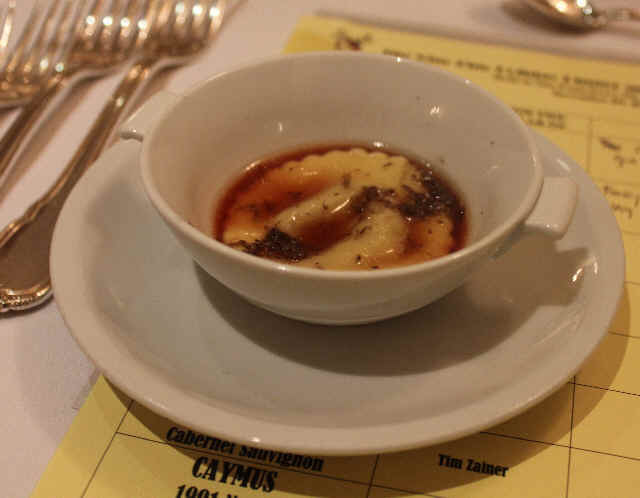 The Lancelot-Pienne "Cuvee de la Table Ronde" was also very fine...from magnum. If the Agrapart is from 7 different villages, then this wine might be called "Trois Crus," as it hails from three towns. It's entirely Chardonnay and all three sites are Grand Cru locales. With some bottle aging, this wine was much more complex than it was a year ago. 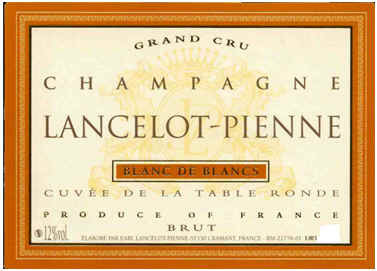 More toasty and creamy, thanks to additional bottle aging, Lancelot's was also quite good. After demolishing the oyster and shrimp platter, we took our places at the dinner table and Jack got up and and said "Grace." ...or "Helen" or "Beatrice" or something like a State of the State of the Vino Fino group. "If you're gonna say Grace, then don't let's not fergit to say Trish, too." Our waiter for the evening, Paul, then brought out a little Amuse Bouche...a nice surprise! This was delicious! It was King Crab wrapped with some kind of compressed melon! 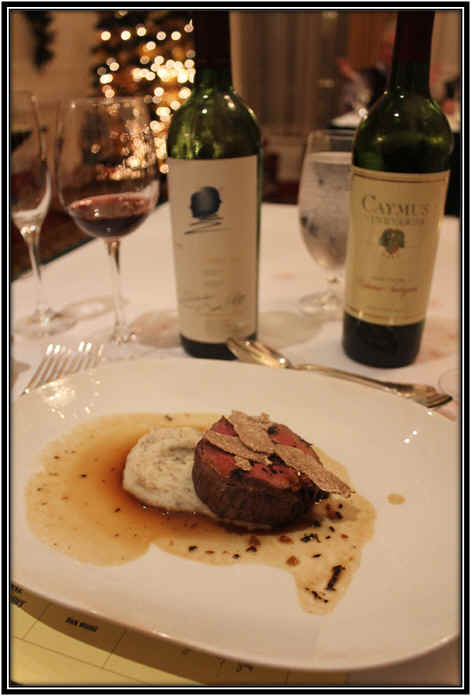 The flavors were fresh and simple and yet each element on the plate sang beautifully. 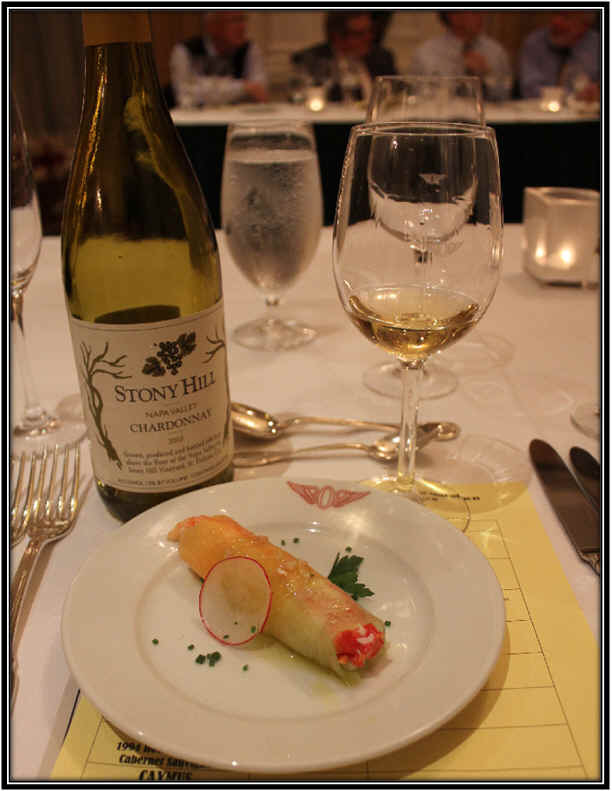 The 2003 Stony Hill Chardonnay was in good condition...mildly woodsy with a wood spice note that was pleasant. It's a rare California Chardonnay that can hold up this well for so many years. 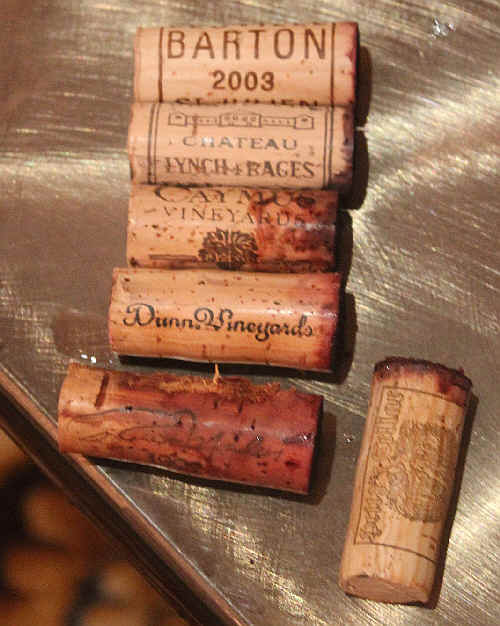 The next wine was even older and yet still remarkably youthful. 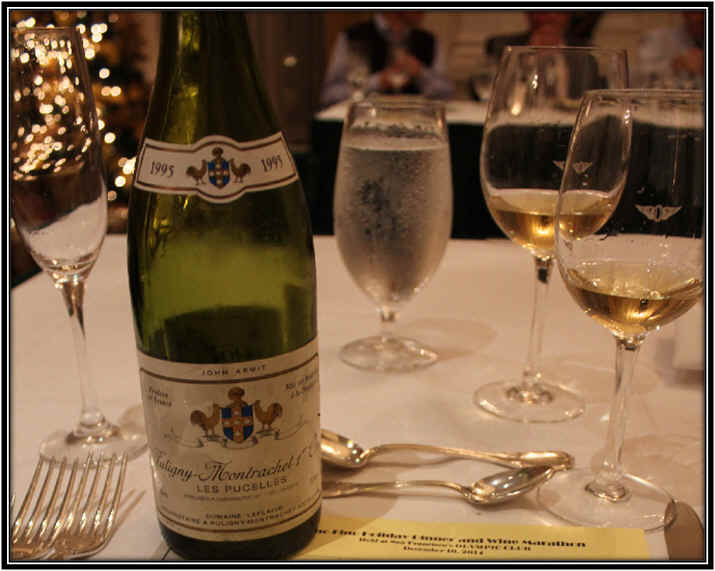 At 19 years of age, this Domaine LeFlaive Puligny-Montrachet was stunning! Crisp, smoky, toasty...classic and still young. If you're lucky enough to have some 1995 Leflaive, if your bottles have been well-stored, they can probably hold up for another 10 years. Maybe more. The 2003 Leoville Barton was quite good and it seemed to blossom as it sat in the glass. Some people criticized the 2003 Bordeaux wines as being a bit lackluster due to the extremely hot growing conditions, but this wine was nicely balanced and certainly drinkable now. It showed dark fruit and some woodsy notes...mildly herbal and faintly leathery, too. 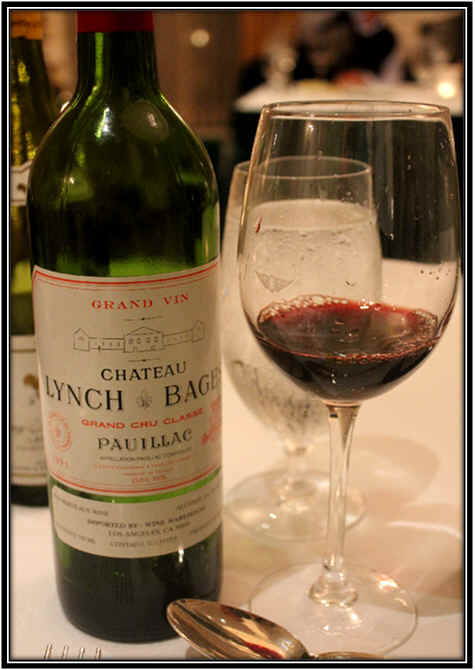 The 1995 Lynch-Bages is holding up nicely, but it's not an especially complex wine. It displays a ripe element and some dark fruit notes. When you hear critics discussing a wine's "breeding" or nobility factor, the previous wine from Leoville Barton has it, while this wine is a bit shy in that department. Still, it is a nice bottle! This was a good pairing! 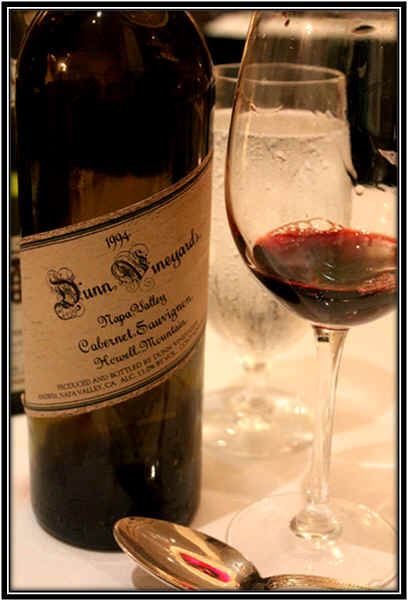 The 1994 Dunn Howell Mountain was almost more Bordeaux-like than the two preceding bottles! It is showing well at this stage, nicely developed but still a bit youthful. Very fine. 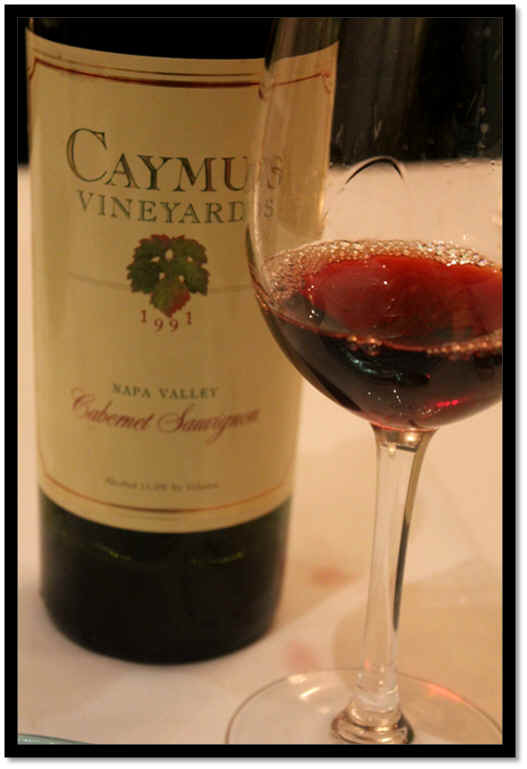 The 1991 Caymus was a bit odd. On the one hand, there's a nicely woodsy, oaky quality to the wine. But this bottle also had a decidedly "nutty" character suggesting it may be falling apart. 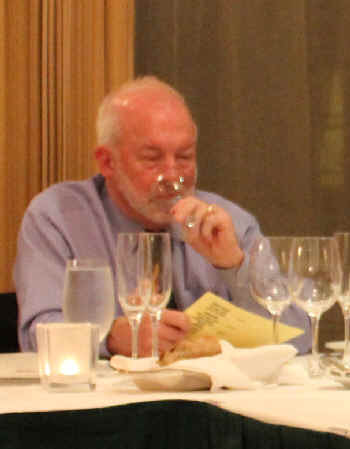 The Sherry-like, oxidized fragrances were prominent, especially on the nose. Holding up better was the 1991 Opus One. I've certainly liked the wine they make, but was a bit overwhelmed by exactly how good this was showing! This was beautifully balanced and elegant...very complex, with cedar notes and some dark fruit tones. It probably can hold up nicely for another decade if well-stored! 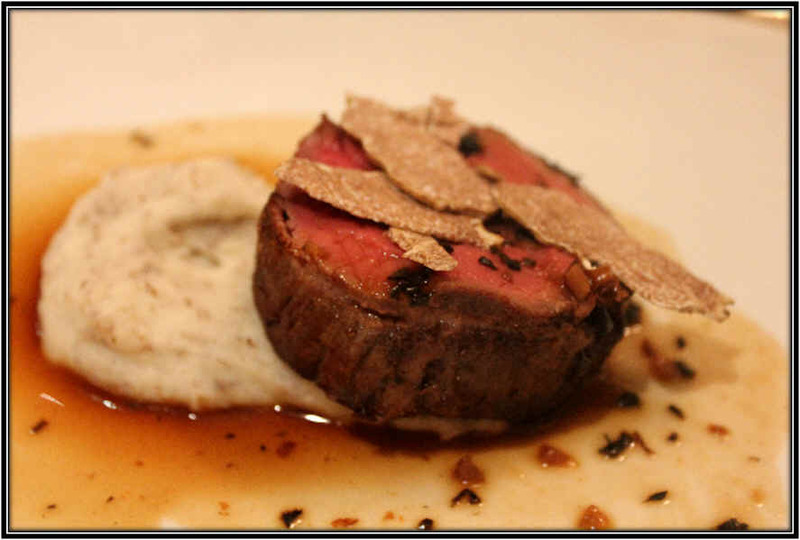 We had Japanese Wagyu Beef with some shaved black truffles...and the truffles were spot-on aromatic in character. Delicious. 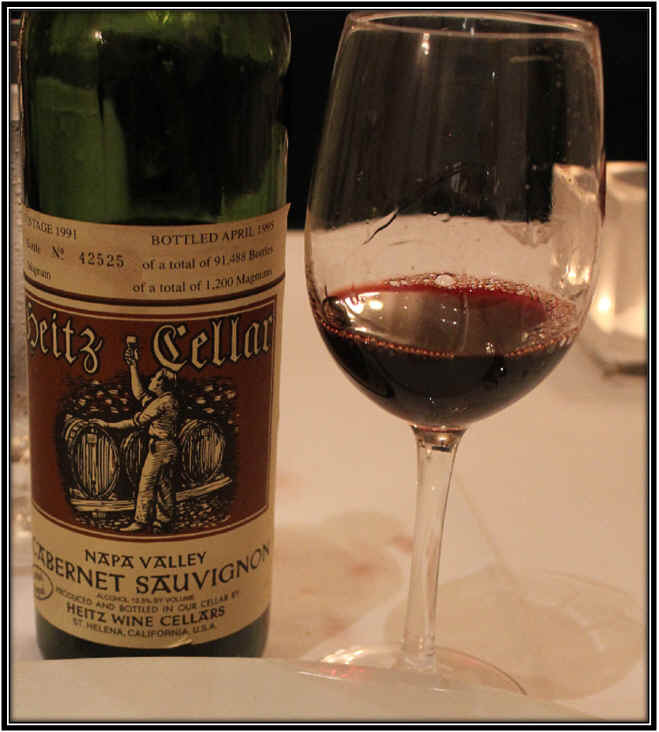 The 1991 Heitz Cellar "Martha's Vineyard" was a stellar bottle. Some people find its character to be a bit quirky and odd, as there's a minty or eucalyptus character which is the hallmark of this wine. It was in "mint" condition (pardon the pun)...beautifully youthful and displaying the classic "Martha" characteristics. Very fine. 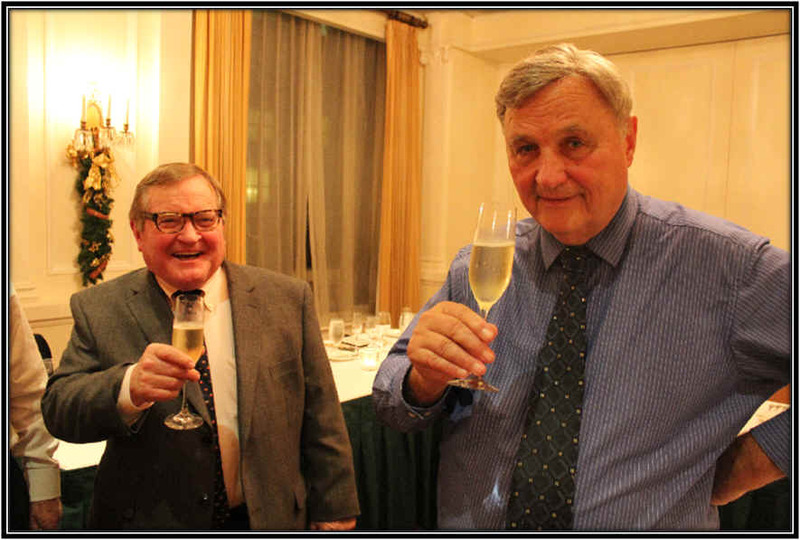 John McGlothlin brought out a golden oldie...a 1968 Concannon "Limited Bottling" Cabernet...essentially their 'reserve' wine. It was still hanging in there...color was a bit brickish, as one would expect. The nose was mature and showing a faintly smoky tone. It was a rather nice bottle and a great remembrance of days gone by. In those days, Livermore was on par with Napa and Sonoma. 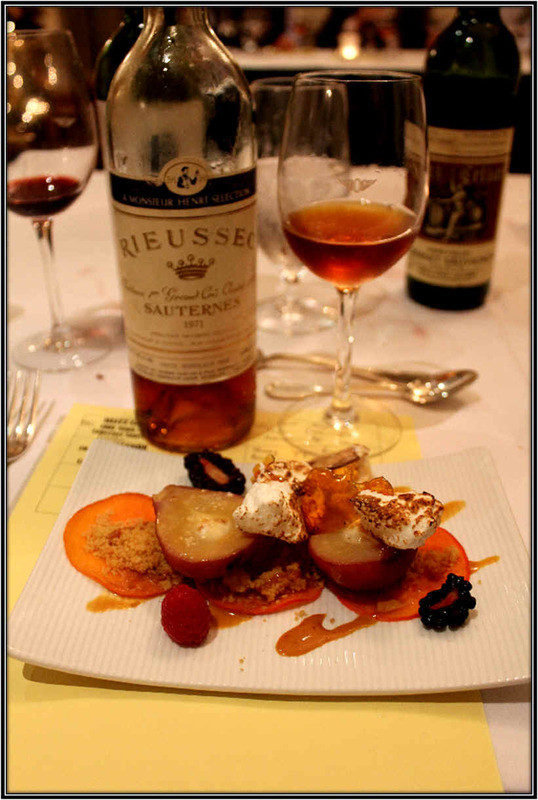 Dessert featured a splendid bottle from Allan Anderson: 1971 Chateau Rieussec. This was a well-aged Sauternes, of course...from a great vintage. The Roasted Pear dessert paired handsomely...sweet but not heavy. And the Rieussec showed apricot and honey notes. 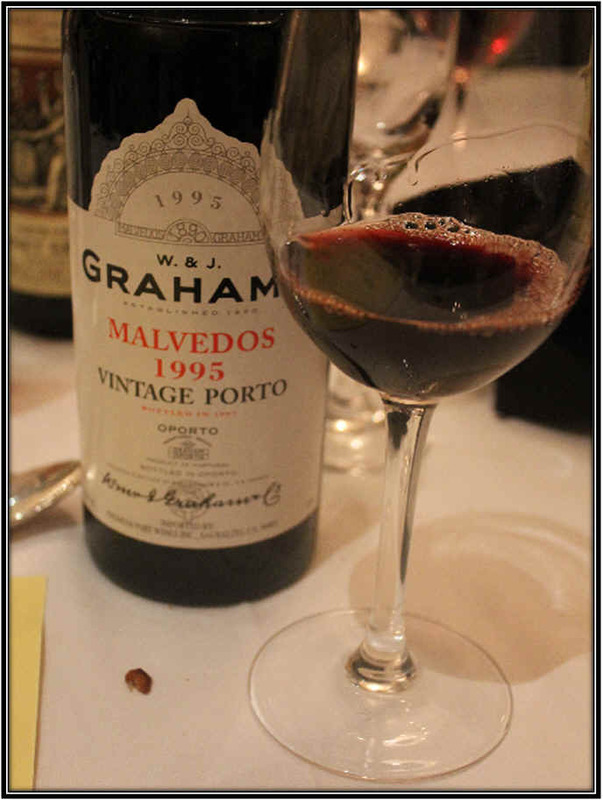 And then post-dessert and pre-coffee: 1995 Graham's Porto. This showed some nice fruit and mild spice notes...fairly well-developed and certainly ready to drink now. 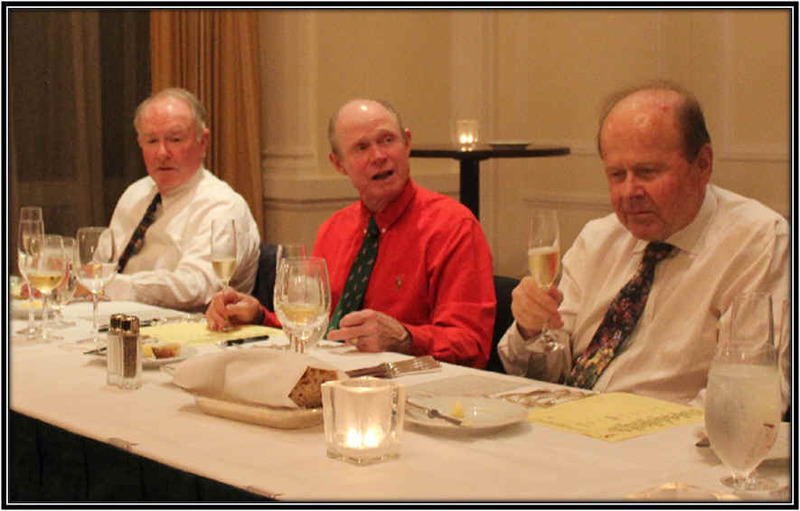 And that was the line-up for the 2014 Holiday Dinner. Many thanks to everyone who contributed to this memorable event!